Oh No, That isn’t Forsythia! One of my gardening pet peeves is forsythia. Yes, a beautiful shrub, a shot of sunshine in early spring able to lift winter-worn spirits, which many enthusiasts love, but poor pruning often mangles the potential for beautiful sprays of flowers. My own employer is guilty. The photo shows shrubs found at the entrance of otherwise well-landscaped grounds. Of course, before any shrub is every placed in the landscape, it should be selected for how its characteristics will naturally develop. Plant selection, however, is an extensive topic in its own right, and not of importance now if you already have one in your yard. Forsythia develop into beautiful natural-looking hedges, but are not meant to be sheared into smooth planes of foliage like privet. If you want topiary, begin with a shrub more inclined to become what you want. Forsythia’s natural character is to look unkempt and natural-looking with long arching branches. They can overgrow their site, which again goes back to the subject of plant selection. Next year’s flower buds form during the early summer, so shearing branches after they leaf out removes next year’s flowers. 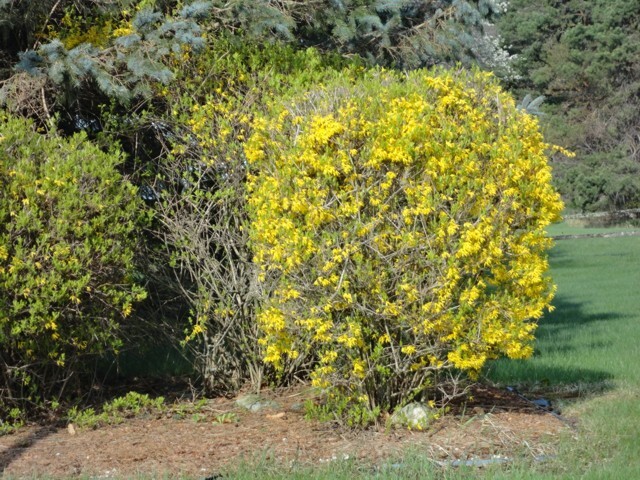 New homeowners often inherit ungainly forsythia problems. The yard came with these shrubs in place. After years of neglect, forsythia might be growing in shade. These shrubs should be removed as they will never bloom to full potential. If it’s a case of an overgrown shrub or little flower production, pruning is a (relatively) easy job. The best time to prune in very early spring before they shrubs bloom, or just after they bloom. Yes, if the plants are pruned before they bloom, flower potential is being cut out, but it is easier to see the branches, or canes, at that time. One third of the thickest, oldest canes should be cut back to ground level, along with any dead or broken canes, or any that look wildly out of place. That’s it! Pruning forsythia three years in a row rejuvenates the entire shrub, and it won’t need pruning for a few years unless a smaller shrub is desired. Isn’t that simple? Next spring the long elegant canes will reward all viewers with a profusion of flowers.